Dr. Shimizu originally studied to be an engineer like his father. After two and a half years of math, physics and technical courses, he decided that a more “hands-on” and people-oriented career was more to his liking. He graduated from UC Berkeley in 1980 with a degree in Biology but had no plans on entering the dental profession. A few years after graduation, he visited his brother who was in dental school and decided that this might be an ideal career direction. Dr. Shimizu attended the University of the Pacific School of Dentistry in San Francisco and graduated as class valedictorian in 1985 with his Doctorate of Dental Surgery. He was then fortunate to be selected as one of five residents to continue their studies in the UOP Department of Orthodontics, one of the highest ranking programs in the nation. He obtained his Masters of Science in Dentistry degree and Orthodontic Certificate in 1987. Immediately following graduation, he was asked to join the UOP orthodontic faculty. He continues to volunteer his time as an Associate Professor on a part-time basis and has been a course director to the first year residents for over 30 years. Dr. Shimizu has had the honor of providing orthodontic treatment to over 100 local dentists and their family members. He takes great pride in being able to provide his services to his peers. He has also developed a reputation for treating very difficult cases, is involved with a large number of cleft palate and jaw surgery patients and is on Craniofacial Anomalies Panel at Kaiser hospital. 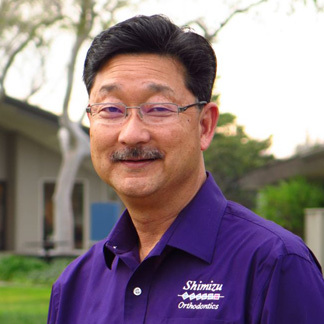 Dr. Shimizu is also the founding member of the Silicon Valley chapter of the Smile for a Lifetime Foundation which is a charitable non-profit organization that provides orthodontic care to deserving individuals with financial challenges, special situations and unique orthodontic needs. Dr. Shimizu is married to Laurie, his college sweetheart. They have two awesome children, Kevin and Stephanie. Stephanie is currently pursuing her Doctorate of Physical Therapy in Miami. Kevin has received his Doctor of Dental Surgery (DDS) degree, and is pursuing his orthodontic residency at UOP, where his Dad is one of his instructors! Kevin is looking forward to joining his Dad in the office in the Fall of 2019.